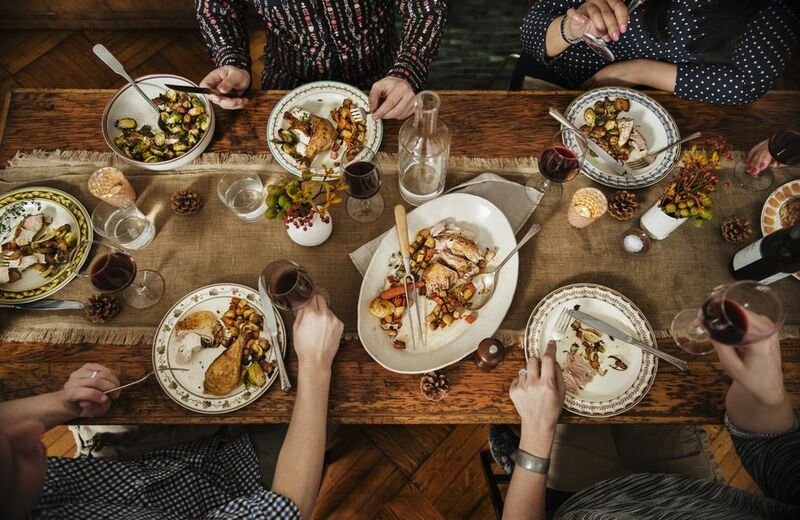 Thanksgiving dinner is likely the biggest meal you'll ever prepare: multiple side dishes, a huge piece of meat to roast, several desserts to prepare (including ever-challenging pie crusts), not to mention, more guests than are usually seated around your dining room table. That's why it's important to plan ahead for Thanksgiving dinner to stay organized and keep things running smoothly. Use this list to prepare in advance for Thanksgiving dinner – when the day arrives, you'll be able to enjoy the holiday, knowing you're well prepared for the celebration. Decide upon a recipe or preparation method for the turkey, then decide what side dishes you'll be serving and pick the recipes you want to use for each of them (A good place to start is this roundup of Eleven Great Thanksgiving Recipes). Write down the menu, and where each recipe is located so that you won't forget: mark the recipes in your recipe books, or, if they're found online, print them out and keep them in a folder for easy reference. This list can also serve as a reference for shopping and for remembering everything that needs to be done on Thanksgiving day. If you are unsure of how to roast a turkey, make pumpkin puree or prepare a pie crust, now is the time to read up on the proper method. If you have time, you could also find videos showing various techniques (such as carving a turkey) or even do a trial run of certain recipes or cooking methods. Read through your recipes and visualize the preparation of each dish to make sure you have the tools and appliances you need to prepare each one. This list of essential Thanksgiving cooking equipment can help determine what you might need. Be sure to consider whether you'll be making dishes that both will require the same tools or pans at the same; for instance, do you have enough pie pans for both the pumpkin pie and pecan pie recipes you want to make? Will you be using the same saucepan for the gravy as you will for making the mashed potatoes? You still have time to buy or borrow any equipment that you might need. This way you can make sure that there aren't duplicate dishes or, worse, an omission of an important element of the meal. Make sure everyone knows what they're bringing, if anything, and how many guests their dish needs to serve. Make sure you have the right serving pieces and enough place settings for all the dishes you'll be serving and the number of guests attending. Looking at your menu, decide which serving piece you'll use for each dish. You can even put a sticky note on the underside of each serving piece now, as a reminder of what should go in each dish. Remember that oven-to-table bakers and casserole dishes can double as both cooking vessels and serving dishes (and that's one less dish to wash). By planning this now, you will ensure that come Thanksgiving Day, you won't discover you are short on serving bowls for all of the side dishes. Be sure to have a few extras on hand for dishes that guests might bring, or ask them to bring their food right in the serving dishes. Think about how you want your home and your table to be decorated for Thanksgiving, and buy or make anything that you can do in advance. The week or two before Thanksgiving is a great time for families with children to work on Thanksgiving crafts that can be used at the table, such as napkin rings, centerpieces or place cards. Actually, make two: Make one list that you can start shopping for now and one shopping list for a day or two before the big day. The first list should include foods and ingredients that can be bought ahead of time, such as shelf-stable items like canned or boxed ingredients, as well as frozen goods. If you haven't already, buy your turkey; the longer you wait, the less selection you'll have in terms of size and brand (If you're buying a frozen one, make sure to read up on how to thaw a turkey so you allow enough time). And the second list is for ingredients that are perishable, such as fruits, vegetables, fresh meats, and baked goods, which need to be purchased only a day or two before Thanksgiving. Check to make sure you have enough freezer and pantry storage, then start buying as many of the groceries in advance, using the first shopping list, as you can. If the store's out of something or you forget something, be sure to add it to your second list to buy in the day or two before Thanksgiving. As you shop, don't forget the extras you'll need, such as dish detergent, paper napkins, and paper towels, food storage containers, and other staples. If you work on Thanksgiving planning a little at a time, prepare the meal will seem less stressful and far more enjoyable. After all, enjoying a dinner with family and friends is what the holiday is all about.